Moving every few years makes setting up a work space a home difficult. For the last 7 years, I have been working in a cramped, lifeless space. Not because I wanted to work in a space like this, but because I really didn’t know how to create a space I loved.So, I decided to create a home office that was flexible in space, but beautiful, inspiring and ultimately a place I wanted to be! Before I can tell you how I got to this great space… I should really show you where I started. My desk area was so sad. I have been working off of this tiny IKEA computer desk for at least a decade. It was usually more cluttered than this, but I snapped the picture below just before we tore the desk down to make space for the new office. One great way to save space on a desk is by getting an extra large mousepad so check out the top 10 extended mouse pads here. There was no storage for photography equipment or props. There was no space to make anything pretty. I mean, it’s kinda difficult to make this old computer desk pretty. Yuck. I tried by freshening up a cork board by painting it and I made a few cute jars to put my pens in, but really I really just needed to start fresh. Oh and did I mention that all of this is happening in my bedroom? So yah… my before desk was pinned into a corner next to the closet. 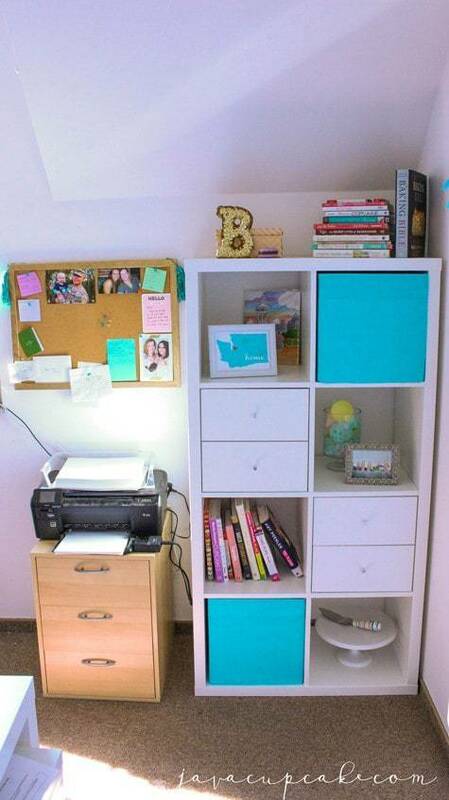 I began collecting ideas and pinning them on my Pinterest Home Office Board. As I looked at all the pictures as a whole… I noticed a trend. 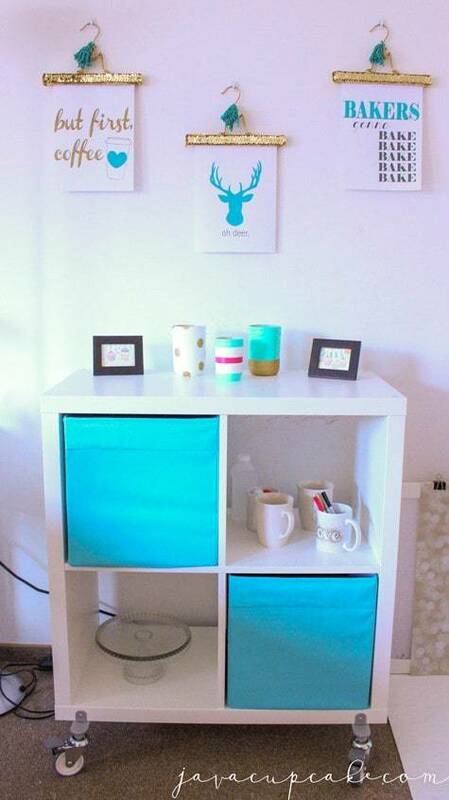 I like white, clean lines and teal/aqua as an accent color. I also realized that I wanted a large work space. One that I could do DIY projects on, help my daughter with homework on and one that I could use during my photo sessions for the blog. I also knew I wanted lots of storage and shelving. I wanted my desk to sit in front of that storage/shelving and not be pressed up against the wall. So with all these things in mind, my husband and I went to IKEA in Nuremberg with an open mine and a budget of €400. My new Office Furniture also had to fit into the space in my bedroom that I created by removing everything but my bed, dresser and one shelf for the TV. The desk I purchased was the MALM desk with pull-out panel and the ERIK three drawer unit with wheels. The pull out panel is my favorite. It allows me a space for the drawer unit right next to me, but out of the way and it pulls out whenever I need more space to work. I love having the drawers on wheels because I can easily move it creating a space my daughter and I can both sit at together to do homework! The surface of this desk is huge. It allows me to lay out my computer, place for all my glass jars that hold my tools, note books, a pretty vase with flowers (also from IKEA) and even a photo of my family. My notebooks are custom made from May Designs. I use them for EVERYTHING! The glass jars are a DIY project I did a few months ago. They are super simple to make. I just collected jam jars, cleaned them out, put a little tape around the middle then spray painted them gold. Once the paint was dry, I took the tap off, added a cute yarn tassel to one and now I’ve got cute jars for my desk to hold pens, scissors, etc! Super easy and super cute! The wood tray I found at a local drug store for just a few Euro. It holds my chapstick and a few bobby pins. Keeps those things contained, accessible and out of the way. 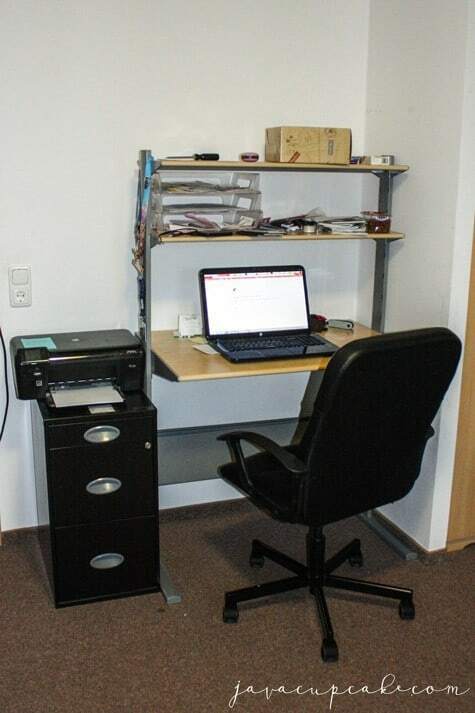 Behind my desk is the KALLAX shelving unit, also from IKEA. I added two sets of drawers and two teal storage boxes to the unit to add space for storage. I like that I can display things in the empty space and store things in the drawers. 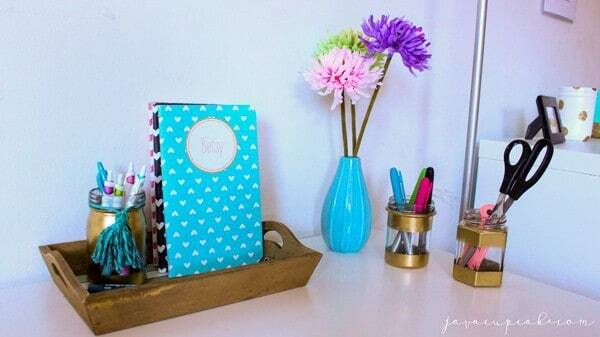 Clean and cute with no clutter. I had the small wood drawers already, so it made a perfect space for my printer under my bulletin board. The frame of the board has been painted gold and teal accent tassels in yarn added for a punch of color. 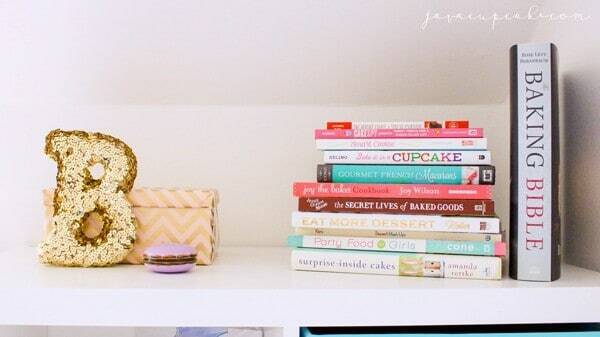 On top of the shelving I am not able to display my favorite baking books. Besides the Baking Bible, I am friends with all of the authors of these books. I like looking back and being inspired. Someday… maybe someday, I’ll write a book and add it to that pile. The Monogram Sequein Letter “B” was made for me by my blogging bestie, Rachel of MyDIY.life. You can get one of your own in her shop HERE! On the other side of my desk is my photography prop storage. Inside this KALLAX shelving unit with wheels, I have two additional storage boxes. Inside, I keep my two DSLR cameras and 4 lenses along with all the additional equipment I need for them. On top of this storage unit, I have two mini pieces of art from CakeSpy and custom made mason jars from Just Add Glutter by Marla. I found the jars when browsing Instagram and contacted Marla to make me a custom set for my office! Aren’t they gorgeous? During this makeover process, I also wanted to incorporate some art into my design. But, being on a limited budget, I knew I had to get creative. So, I came up with several printables & other wall hangings that really brought character to my office. 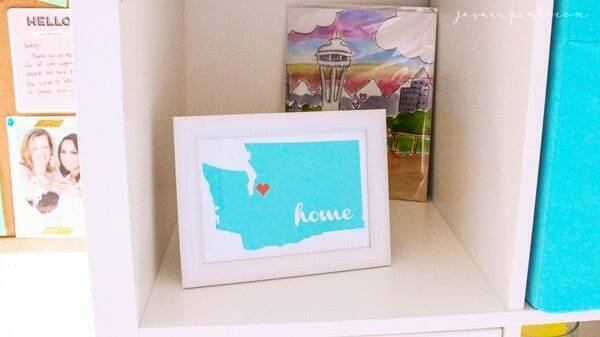 Like the Washington state silhouette above! 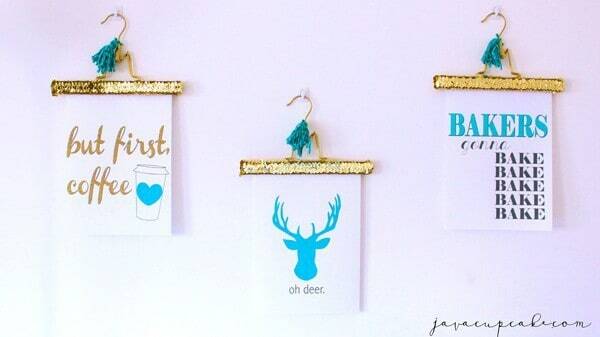 These three printables were the first ones I made and I’m in love. Rachel inspired me to hang them on these hangers, which were also DIY! 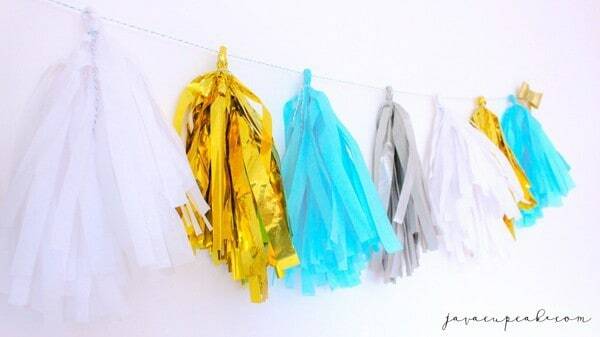 I used wood pant hangers and spray painted them gold then hot glued a strip of gold sequins on an elastic band to the front, tied a teal yarn tassel to it and done! Perfect place to hang my printables! You can find all these of these printables in my ETSY shop if you’d like them for your home or office too! I had just enough sequins left to add a bit of flair to an old black picture frame. 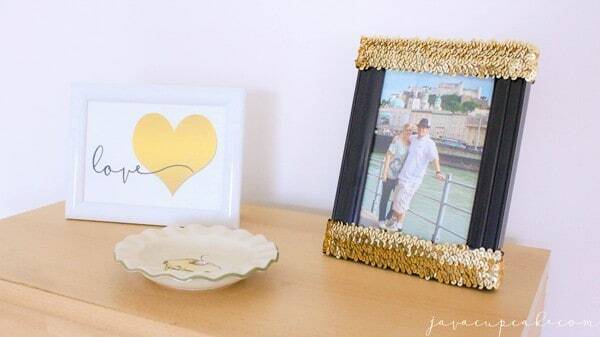 I think it perfectly matches the love-heart printable I made on top of this storage dresser. And finally… probably one of my favorite parts of my entire office… the tissue paper tassel garland! Again, Rachel was my inspiration for this! She has the cutest tassel hanging in her office and even supplied me with the grey and gold paper to make my own. There are several tutorials online you can watch to see how to make them… but I’ve decided to make a tutorial of my own on how I made them and post that later! Stay tuned! 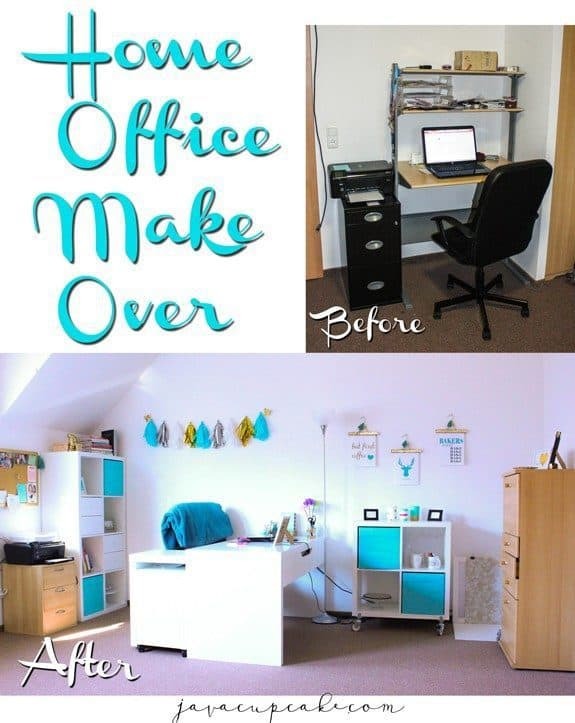 So basically… with a little inspiration, a vision and a relatively small budget… I was able to transform the extra space in my bedroom into a home office! I seriously spend most of my time here now and my family is not allowed in this space! I love how the light from the windows hits the white furniture and brightens everything. The gold and teal accent colors make me happy every time I look at it! Seriously… if I can create this space… so can you! Home office is a place that should be cozy and quite. This is exactly how yours look! Really nice! Thumbs up!